According to our head custodian, the local fire marshal visited our school over Thanksgiving break. And she seemed to be celebrating Festivus rather than Thanksgiving, because her List of Grievances was a mile long. The list of complaints ranged from the small -- my room was not highlighted on the campus map in my classroom -- to the largely annoying -- the mandate that there can be absolutely nothing 18 inches from the ceiling. This is going to be tricky, because I like to try and use space effectively. So when I see that there is about 2 feet of space between the top of my cabinets and ceiling, I tend to think that that's a great place to store the 14 FOSS kits that I am required to keep in my room. For anyone unfamiliar with FOSS kits, they are large rectangular storage drawers, which measure approximately 8"X12"X18". So now I'll have to find someplace else to keep those large, bulky, almost entirely unused items. And because of my bad back, I'll have to ask the custodians to take them down for me. Which means that most likely the kids will be treated to the site of a 6'4" man standing idly by, watching as two petite women climb a ladder to do the dirty work. So that's very annoying. But there was one other complaint from the fire marshal. This one didn't affect my classroom, thankfully, but even just hearing about it made me wonder exactly how we're supposed to follow it. She said that no more than 10% of our walls could be covered with paper. Never mind the obvious question of "WTF???!? This is a classroom, you nitwit, there should be paper all over the walls!" But more pressing, how are we supposed to know when we've reached that 10% mark? It's not like the walls are painted in 10 color-coded zones, and we can see exactly when we've filled up that Green zone. Like I said, my room wasn't cited for this particular violation, but I'm going to go ahead and assume that I'm sitting right at the 9.9% mark, and therefore I can't put anything else up on my walls. If I'm asked to put another rubric up -- "Sorry, that would put me over 10%." On a completely unrelated note, I got on to one of my little girls yesterday for wasting Kleenex. I was already annoyed at her for her over-the-top antics of covering her entire face to impress upon me the fact that she really needed a Kleenex. But then when I saw her grab one tissue, touch it to the tip of her nose and then immediately grab another tissue, I told her that she owed me a quarter. "Kleenex cost money, don't you know, so you need to bring a quarter tomorrow for that extra Kleenex you wasted." When this little girl came into my class at 10:30 this morning and kept holding out a quarter to me, I had completely forgotten about my little tirade. When she finally told me it was for the Kleenex, I said thank you and took it. Later in the day, I told her that she could have the quarter back if she promised to only use one Kleenex at a time, to which she agreed. This week's Mr. Teacher column, now up at education.com, is an imagining of what might be overheard at a parent-teacher conference if the parents involved were celebrities. Bruce Willis, David Letterman, Martha Stewart and Tom Cruise are among the guest list. My partner from last year, Mrs. Educator, is a fourth-grade teacher this year, and she told me a great story yesterday. It involved one of our kids from last year, who is now in her class this year. For anyone who keeps track of such things, this is the kid who thought George Bush was on the back of a nickel, and who ended his summary of what he liked about math class with, "Have a great day." Apparently, his behavior has gotten much worse since last year, and it wasn't that great to begin with. But on with the story. This young man went to use the restroom and then came back to Mrs. Educator's classroom holding himself in a sensitive area and complaining of pain. His claim was that he "zipped up too fast." Mrs. Educator sent him down to the nurse's office, and he returned a while later, limping, and with an ice pack applied to his groin. Now I'm sure that there are many questions that could be asked about this story, but I'm just a little amazed that Mrs. Educator refrained from asking him, "How did you get the beans above the frank???" Darnit, Thanksgiving Break will officially be over in just a few hours. Another workweek will begin, and there will be four more straight weeks of school before Christmas Break. So since I have nothing original to write about tonight, AND with a disgraced and disbarred professional football player coming back into the fold, I thought I would repost a somewhat popular post from this past May. Something occurred to me. I started thinking about athletes’ salaries. They are usually fixed when the contract is signed, but several years back, Ricky Williams -- running back out of the University of Texas -- made news by signing a very detailed agreement. He would effectively get paid by the carry, by the catch, by the touchdown, etc. More recently, poor Ricky has made news for other things, but at the time, I thought the idea of his contract was pretty darn cool. So let's apply it to teachers. Sign us on at some base salary -- let's say $25,000. But we can increase our take-home by documenting events from the following list. Teachers would get paid for every occurrence of the event, not just one time. Child giving you the RING fingerand then saying, "What?!? It's not the middle finger! I'm sure that there are many other things they could be added to this contract. But I think that many teachers would agree to something that followed this kind of format. Heck, if I got paid $25 every time one of my kids cried, "They're skipping!" I'd be able to retire to the Caymans from this year alone! Hey everyone, this post really has nothing to do with teaching or education. But I'm wondering if anyone out there happens to have, or know how they could get, a pair of tickets to the NCAA men's basketball Final Four in San Antonio this season? I entered the lottery selection to get a couple of tickets back in August, but I was not among the fortunate who were selected. I know that I could buy a pair of tickets off of Stubhub.com or Ebay, but those are hardly reasonably priced. So if anyone has any alternatives, I'm all ears! I just got back to my house after a lovely Thanksgiving with my family, and I thought I would give my school e-mail a look see. Apparently, someone flipped the "Spam blocker" switch from OFF (where it has been for the past year or so) to PLEASE SEND MORE. I didn't get THIS much spam when I had a Hotmail account!! About a month ago, I got an e-mail from a lady who works at BillCosby.com asking if I would be interested in receiving, reading, and reviewing a new book co-written by The Cos. Being a big fan of Dr. Theodore Huxtable (I mean, my parents even videotaped and saved every episode of the Cosby show), I readily agreed. A few days later, I received Come on People: On the Path from Victims to Victors, by Bill Cosby and Alvin F. Poussaint. I have just finished reading it, and I found it very poignant and powerful. The main focus of the book is on the American black family -- its problems, its struggles, and its possible solutions. For young black males especially, there is an overwhelming feeling of victimhood that just continues to build and build with every passing day. Too many of these kids accept this with a sense of fatalism and do absolutely nothing to try to dig themselves out of the hole that they find themselves in. Instead of strengthening family bonds, they reach out to false surrogate families such as gangs and drug dealers, and they get themselves involved in lives that have no worth or meaning. The authors bemoan the erosion of the family values that used to exist with a father and a mother bringing up the children, lovingly disciplining them, and modeling right and wrong. Heartbreaking statistics reveal that so many young black men are growing up in families where there is no father figure present to demonstrate how a man should act. And without that role model, the cycle perpetuates itself. These young black men might get a young black girl pregnant, and then their instinct is to run from the issue, rather than staying to support the baby. The statistics are also overwhelmingly high for these kids to drop out of school early and to be in jail for some portion of their life. Cosby and Poussaint have traveled the country, discussing these issues in community call-outs. In these call-outs, various people have shared their own personal stories of adversity, despair, and triumph. Many of these stories are contained within the chapters of Come on People, and they are inspiring to behold. Come on People should be read by everyone, regardless of age, race, or class status. The only way any of this is ever going to change is if we decide to change things for ourselves. Head on over, but don't just fill up on the mashed potatoes and stuffing. Save some room for the bird! Happy Tuesday before Thanksgiving, everyone! This has not been a good year for me in terms of health and non-sickness, as I am currently midway through what seems like my 10th cold of the school year. Fittingly, my column on education.com this week (up today!) is about teachers and sick days. Maybe it's just me, but I have found that taking a day off as a teacher is MUCH more difficult than taking a day off in the corporate world ever was. Does anyone else have any opinions about this? If so, please leave some comments over on education.com. Anybody have this whole week off -- raise your hands! I thought I'd kick start the week by posting about something to give thanks for. One aspect of my daily job that I truly enjoy. I LOVE the very end of the school day, when the kids get on the buses. OK, at first glance that's going to seem very cynical, but let me explain a little further. Between us, my partner -- Ms. Jenn Ed -- and I have 42 kids. We are required to walk them all individually to their buses. Since there are 12 buses, as well as day care buses and parent pick up on the other side of the building, we decided to divide and conquer. We chose one of the buses, and I take all of the kids who ride that bus and all of the ones in front of it, and she takes all the kids who ride the buses behind it and the parent pick up kids. As it turns out, my group has about 30 kids in it, and hers has about 12. So actually getting the kids out of our classrooms and all the way down the hall to the outside can be somewhat of a hassle each day. But once we are outside, that's when it gets fun. To make sure everyone gets on the correct bus, I use a system that I blatantly stole from Ed U Cater. As my shapeless, pulsating blob of students trudges past each bus, I call out the name of the bus, and then hold out my hand, like I'm asking for money. The kids who ride that bus aren't allowed to go get in line until they have slapped my hand. I am able to count how many times my hand gets slapped at each bus, so I know for sure whether or not the correct number of kids got on that bus. The kids love this, as they're clamoring over each other, waiting to hear their bus called out. When they hear it, they come charging towards me, ready to give me a high five. Sometimes I hold my hand up over my head (I'm 6'4"), and they jump at it, trying to reach it. Sometimes, if they're getting too far out in front of the pack, I turn around and face the other way before holding out my hand, so that they have to come back to slap it. Several of the kids that I drop off have brothers or sisters who are already at the buses waiting for them. When they see me coming, they often run over and want to give me five also. I have to really be mindful of my counting at those points, but it makes dropping the kids off highly enjoyable. Does anybody else have any stories to share about things they really enjoy about their job? Hey everyone, I've been holed up in the house today (sick, again), and so I've added some new products to my CafePress store. Several new slogans, some new designs, etc. 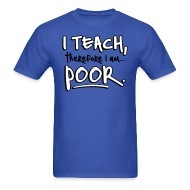 Please check it out, and tell all those teachers you know where they can get some great stuff! I found this site today that ranks blogs by their reading level. You type in the name of the blog, and it tells you whether the writing level is at an elementary level, jr high, high school, etc. I'm pleased to say that my blog is the O-positive of blogs in that it can be universally read by anyone with an elementary reading level. And it makes sense -- I write at the level I teach. I shall have to commence articulating my thoughts at a plateau of more altitude. Here's the link, so you can check out other blogs. I typed in a few others, and wouldn't you know Mike in Texas and Ms. Cornelius are writing at a High School level. But you DO have to type in the correct blog address. Note the difference in level between headoftheclass.blogspot.com (NOT Ed U Cater's blog) and theheadoftheclass.blogspot.com (Ed U Cater's blog). Hey everyone, the new column is up at education.com. This week, the topic is buzz words, catchphrases, and overused verbiage in general. I thought I had escaped that when I left the engineering world, but it's still there, just different words and phrases. Leave comments, e-mail it to friends, let me know what you think! Friday, I had the kids do an assignment in science called, "Helpful or Harmful?" There were given a list of events that could happen to an environment, and they had to decide whether it was helpful or harmful to the environment. They also had to write down some way that that event would change the environment. For instance, the first event was, "Trees cut down to build new houses." For the most part, the kids agreed that this would be harmful to the environment. I was very impressed with some of my students who said that one effect this would have on the environment would be to reduce the amount of oxygen available. Some of the other responses were not quite as impressive, but still memorable. Here are a few. Event: Filling up a pond to make a parking lot. "Harmful, because the frogs would have no place to swim the fish would die and turn into fossils." "Armful, because the fish live there and they wanted their home." "Helpful -- putting cement is helpful because it's making the water clean." Event: A flood brings fertile soil to a river bank. "Harmful -- it's bad to spill soil to the river because it makes the fishes die." "Harmful -- the river bank will look gross." "Harmful -- a flood is bad, it mostly comes from the toilet and it can be very nasty n-a-ste and it can ruin the soil on the land." "Harmful -- no one would be able to pay money at the river bank." Event: An oil spill in the ocean. "Harmful -- the oil will turn the ocean green, yellow, orange, black or white." "Harmful -- no one will swim in the ocean." "Harmful because like if one of the sharks in the ocean it can have its mouth open and the oil drops it can go in its mouth and the shark can swallow it and it can go in the sharks mouth and the shark can die from it." Event: Collecting old newspapers in the neighborhood for recycling. "Helpful because it will make less trash on the floor." "Helpful -- so people can't read them any more." Event: Building a bird house and feeder in your backyard. "Harmful -- garden will be destroyed." I have noticed via my stat tracker that my page has been getting a lot of hits coming from the search string, "Secret Santa Questionnaire." As far as secret Santa gifts go, this was shaping up to be a most bizarre example. It was soon to get even stranger. I unwrapped the large bulky item, and I found a large bone with a few shreds of meat still hanging determinedly from it. For about 10 seconds, my mind cycled through all of the possible third words for the phrase, "What the--?”Then I remembered. This was exactly what I had asked for. Every year, before we select each other and find who we will be giving gifts to, we fill out a short questionnaire. Favorite color, food, music, etc. Needless to say, I very rarely take that questionnaire seriously. My answers are almost always of the facetious variety. So this year, when asked for hobbies, my response was, "Collecting the bones of ancient Roman emperors. "Can I just say one more time -- my secret Santa is a freakin’ GENIUS!!! 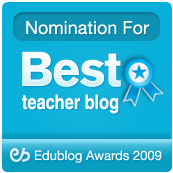 Learn Me Good has been featured on So You Want to Teach as the Reader Appreciation blog for November 9, 2007! Today was such a freaking long day. And I hadn't planned on it being that way. When I pulled into the school parking lot this morning, I began to hear a weird thumping noise from under my car. I pulled into a parking space, and looked under my front tires, and it looked like a little plastic piece was bumping against my tire. I didn't think about it again all day long. s birthday celebration). As I started to pull out of my parking space, I immediately knew I had a flat tire. Sure enough, there was a piece of metal wire about 2 feet long and about half a centimeter (we're doing measurement this week) in diameter sticking out of my tire. Where the hell it came from, who knows? I broke out the jack and spare tire (never been used) from my trunk and proceeded to take the lug nuts off. About that time, this guy who is the father of one of my students from last year (take a moment and digest that) came over to help. Thanks to him, the job went a LOT faster. Afterwards, when I shook his hand and thanked him profusely, he said, "No problem. You taught my son last year." 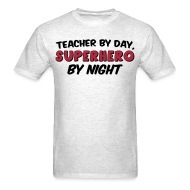 I guess there's some tangible reward to being a teacher after all! For some reason, it went up late today, but the new column is up and running over at education.com! This week, it's all about Do's and Dont's for dropping kids off at school (as opposed to them riding the bus). Unfortunately, I'm not supposed to copy anything from that site, not even the title, but I can tell you that if you like the TV show, Heros, you'll appreciate this week's title. Thanks to everyone who checks it out, rates it, and leaves a comment! Was it just me, or were there not nearly as many trick or treaters out this year as last? I have SO much candy left over, and the number of door knockers was way down this year. So I did go ahead with my plan for selective candy giving. I had a big plastic bowl filled with Twix and Nestle Crunch bars, and inside that, a tiny little cup with candy corn inside it. To answer one person's question, I had no problem giving good candy to the older kids, as long as they were in costume. Though I felt a bit awkward seeing the kid in the orange m&m costume who appeared to be 18, who came up to my door alone and said, "Twick o tweat!" One group of about 7 kids approached, and I gave out Twix, Nestle Crunch, Nestle Crunch, Twix, Twix, Nestle Crunch, one candy corn. Six little kids in costume and one teenager in street clothes with a plastic grocery sack. When I put the single piece of craptastic candy into his bag, he glared at me and said, "Man, that's all I get??" I replied, "Yep, that's all you're dressed for." On the radio this morning, I heard a story about a high school social studies teacher who would ask the kids geography and government questions when they came to his door on Halloween. The kids who answered correctly walked away with candy. The kids who said Ronald Reagan was our first president walked away empty handed.